Dr. Pazos, MD, PhD, the Institut’s glaucoma specialist, has recently published an article in the prestigious scientific journal Ophthalmology titled Diagnostic Accuracy of Spectralis SD-OCT automated macular layers segmentation to discriminate normal from early glaucomatous eyes. 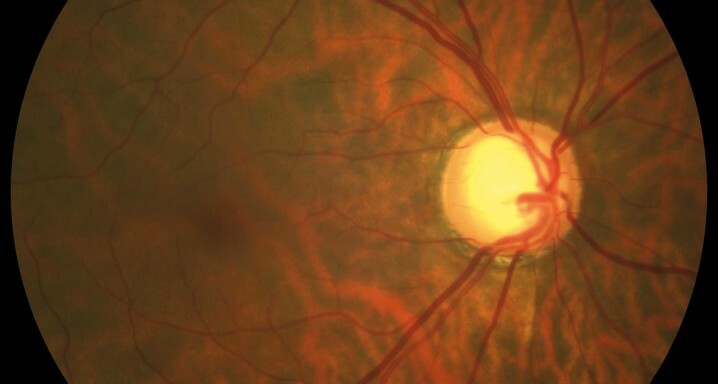 The participants in this study include investigators from the Institut (Dr. Biarnés, MPH, PhD), from the Hospital de l’Esperança (Dr. Dyrda, MD, Ms. Mora and Dr. Fatti, MD) and from the Catalan Retina Institute (Dr. Gómez, MD, Mr. Martín, DOO, Dr. Antón, MD, PhD). Figure 1. Infrared image of the macula with the circle of the zone assessed by SD-OCT for analysis. Upper left image: map of thicknesses of the layer of macular ganglion fibres. Upper right image: map of thicknesses of the layer of macular ganglion fibres. Lower left image: quantification of the thicknesses of the layer of macular ganglion fibres. 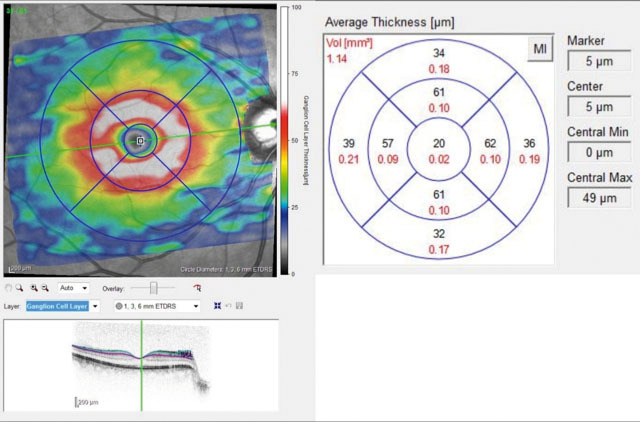 The study’s aim was to determine how the new software behaves in the separation and automatic quantification of the thickness of the different macular layers by the Spectralis SD-OCT in the detection of patients with incipient stages of glaucoma, in comparison to a usual imaging technique: the analysis of the thickness of peripapillary fibres, which are measured by the same equipment. Figure 2. Upper image: SD-OCT section of the macula. 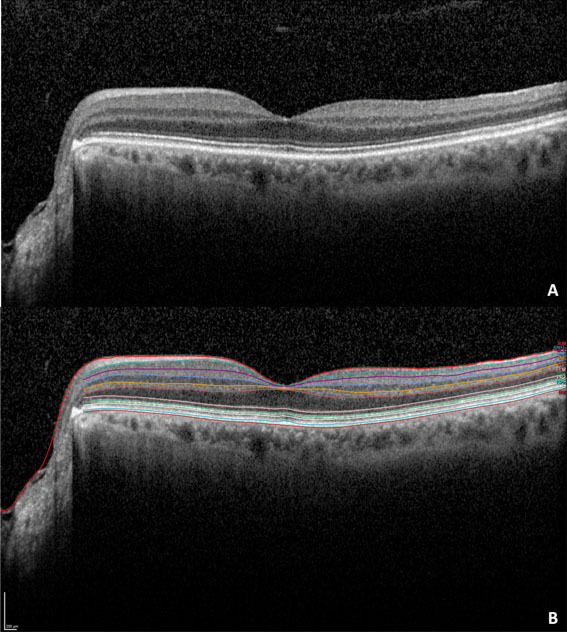 Lower image: SD-OCT section of the macula with segmentation (separation) of each layer of the retina. The analyses showed that both techniques are excellent for differentiating between healthy patients and those with pathology. Moreover, the new segmentation software did not improve on the conventional peripapillary test. In fact, the conventional peripapillary test with the SD-OCT detected some cases that were not identified by the new algorithm for separating macular layers. The results confirm that the analysis of the thickness of the layer of peripapillary fibres with the SD-OCT continues to be the imaging technique of choice for early diagnosis although the new software for separation of macular layers can complement the diagnosis in some cases.